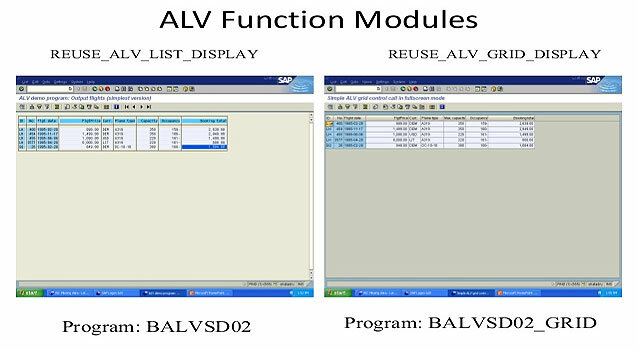 SAP provides a set of ALV (ABAP LIST VIEWER) function modules, which can be put into use to embellish the output of a report. This set of ALV functions is used to enhance the readability and functionality of any report output. Cases arise in SAP (Systems, Applications, Products in Data Processing) when the output of a report contains columns extending more than 255 characters in length. In such cases, this set of ALV functions can help choose selected columns and arrange the different columns from a report output and also save different variants for report display. This is a very efficient tool for dynamically sorting and arranging the columns from a report output. The report output can contain upto 90 columns in the display with the wide array of display options. Sap standard type pools: SLIS , KKBLO . I_LAYOUT TYPE SLIS_LAYOUT_ALV I_FIELDTAB TYPE SLIS_T_FIELDCAT_ALV I_HEADING TYPE SLIS_T_LISTHEADER I_EVENTS TYPE SLIS_T_EVENT. The user can also choose from the list of existing variants using the function module ‘REUSE_ALV_VARIANT_F4’.